On Tuesday evening this week I led a #CraftivistFootprint workshop at Fabrications eco-craft shop 7pm-9pm (which randomly was also filmed for national Italian TV!). January is a great time to think deeply about how we can be the change we wish to see in the world in the year ahead and how we can do it in a fulfilling and sustainable way. So I was keen to harness this enthusiasm and encourage people around the world to order one of our Craftivist Footprint kits to spend time stitching and reflecting and have their completed masterpiece as a physical reminder throughout the year to make a positive mark on the world and not a negative one and to think about what journey we want to go on to have a fulfilled joyful life. Plus it’s a piece we can proudly show others, explain the message behind it and start a conversation with them about their journey and footprint. More than any of our projects this one really does focus on transforming ourselves into the best global citizens we can be (FYI our Don’t Blow It project focus more on building relationships with influential people, Mini Protest Banners focus more on provoking thought and action in the general public). World peace isn’t easy to achieve and sadly it may never be but that shouldn’t stop us from striving for it. It’s often far easier to tell others to do the right thing, deflect blame or say that nothing can change than to look at ourselves and acknowledge what we are doing that we could improve on as votes, shoppers, colleagues, global citizens etc. It’s also daunting to spend time actually thinking about the power we have in everything we do as individuals and the effect that has on others (what we choose to eat for breakfast, what clothes we wear, how we treat others, if we stand up to injustice or go along with it etc). But if we are going to tell others to be part of the solution to injustices surely we have to practice what we preach to gain any credibility? To be good global citizens & craftivist we have to have inner peace: it helps us not burn out, it means we don’t react too quickly and do something stupid in a rage, it helps us be more strategic in our actions with knowledge and understanding to know what the best action is to take for each of us, it means we don’t online pharmacy checker actions that come through selfish motivatations, plus our inner-peace can result in us feeling more fulfilled and joyful in life, hopeful and positive which in turn can inspire others to want to join in our quest to serve and world and people in it, much more than shouting at people to change their ways & forcing them into something they don’t want to do. Don’t you think? Our workshop was sold out with 20 people around our craft tables. I was hoping people contemplate this angle of inner-peace without me force feeding it to them and their super-positive feedback seemed to suggest they did! I made the workshop very structured to really stress to the participants that this workshop is about deeply reflecting and meditating on ourselves & by ourselves before discussing it with others. We all introduced ourselves & honestly spoke about why we came to the workshop. Participants had to read the literature inside the kit alone for 5 minutes. Then read a checklist I had printed of what a good global citizen is and discuss it in pairs looking at what reasonated most with them, what shocked them and/or what they didn’t undertand. We then discussed how we can be good global citizens together sharing what they discussed in pairs. I also do what I always do at workshops (turn into a little dictator for 10minutes!) & ask people to ignore everyone in the room and just focus in on their own work and thoughts whilst stitching slowly to instrumental music (normally the scottish band Mogwai) before they chat away to each other again. 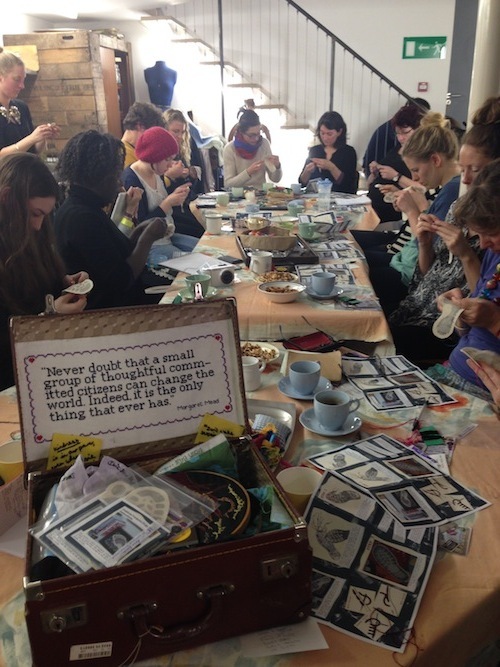 Everyone commented on how lovely the whole group were, how the space was perfect as a safe space to grapple with the issues discussed and how we all felt more at peace at the end but also reenergised to start 2014 on an exciting path to make the world a better place one stitch at a time. Emma Twell: I loved the idea of stitching silently to think about what I was sewing. Those moments are so rare and so valuable. Rose Cronin: Thank you for such lovely couple of hours. You really are an inspiring individual, and I will hang my footprint by my desk, to remind me to “provoke rather than preach. Listen rather than shout. Dream rather than despair. Jane Chevous: Relaxing, inspiring, creative and enjoyable- all in an evening! Thank you, just wasn’t long enough! Loved the silence! Chloe Burrows: Really inspiring way to start 2014. Anonymous: I wish I’d invited my friends! Would love to have another workshop soon! Tom Price: Wicked! Craftivism needs more men. @PandoraVaughan: @craftivists thanks for the reminder to stay calm- today I stopped mid-rant & sat down with my foot for 20mins til I was sane again. 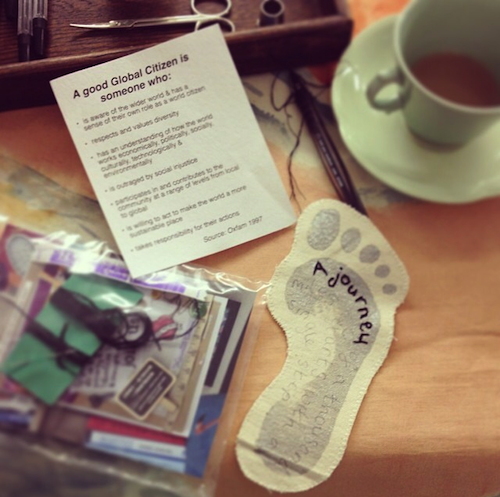 @BarleyMassey: Inspiring eve last night with @craftivists #craftivistfootprint workshop, Italian film crew popped in too! 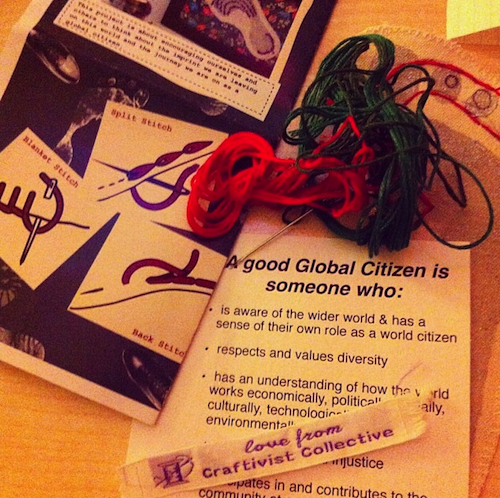 Craftivist Collective is a social enterprise that relies on your support.